SEE student programs are all designed to create opportunities for student prosocial skill development and leadership with a focus on understanding, practicing and reflecting on core ethical values. SEE can provide resources and consulting for secondary schools to participate in Integrity Works! and begin an adult/student collaboration as an Academic Integrity Committee (AIC). An AIC can promote the value of academic integrity to students and faculty. SEE provides consultation on site or via Skype to support the development of an AIC as outlined in SEE's text Creating a Culture of Academic Integrity. Organizing an AIC provides an excellent opportunity to develop student leadership with potential for service learning while resisting the epidemic of cheating in school. Contact SEE to seek consulting support to begin an AIC. 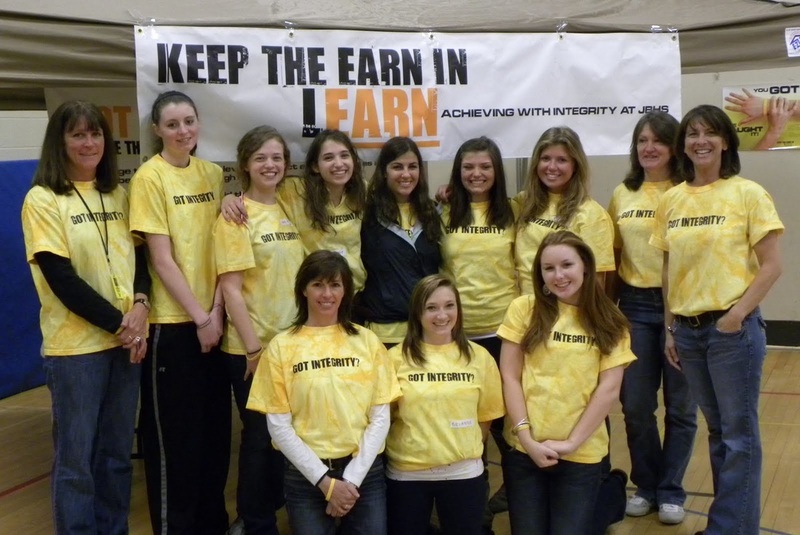 SEE also sponsors an academic integrity PSA contest in Connecticut where high school and college students can submit one minute videos with a message that support academic integrity. ​​Connecticut students in grades 5-12 have participated in The Laws of Life Essay Writing Program since 2000. More than 43,000 students have taken the challenge to reflect and write about the values that will help them live successful lives. Laws of Life provides students with an opportunity to discuss important values and publish their essay highlighting life-affirming character within their community of family, peers and their school. Evaluators of the contest have noted that Laws of Life students gain an appreciation of their own personal values and how those values can provide strength, especially when life becomes challenging. Teachers have noted that the program often engages students in the writing process with the hook to reflect on their core values. 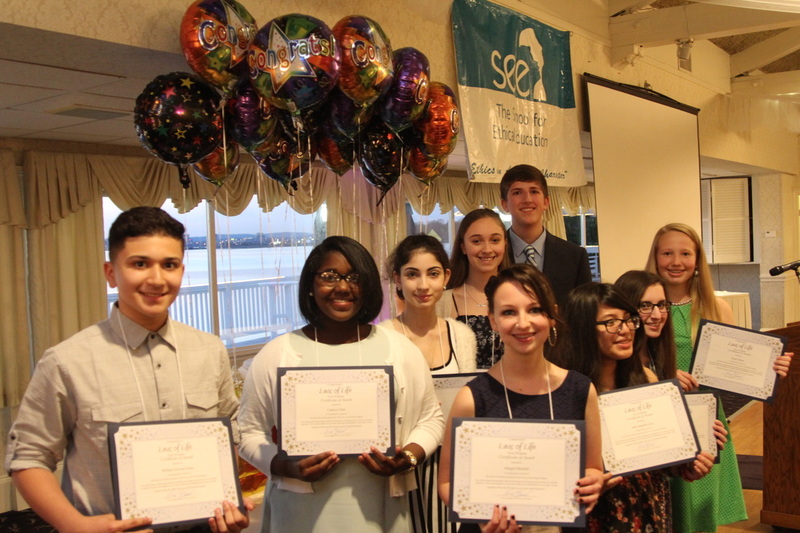 During our annual awards dinner (pictured here), the top ten Connecticut essayists, their parents and teacher celebrate the students' writing at a dinner hosted by SEE. SEE administers Youth: Ethics in Service (YES) as a service-learning project to support positive character development and excellent academic instruction. YES was funded in the past by a Connecticut Department of Education Learn and Serve grant, local foundations and private donations. Service-learning is a research-based strategy to teach and is defined by (1) linking service to clear learning objectives, (2) engaging students in service-project research, planning and implementation, (3) completing meaningful service work, and (4) integrating reflection and evaluation into the project. More than 4,000 students and teachers have participated in over 100,000 hours of service-learning projects through YES. School teams/classes that enroll in YES are provided a training workshop for teachers and students that supports the implementation of service-learning, a written guide to help in planning and reflection and evaluation procedures at the conclusion of the project. Service-learning projects can be implemented to reinforce learning in almost any subject area such as peer tutoring to strengthen subject skill set in tutors, outreach to seniors to deepen knowledge of history and culture, recycling or other environmental projects to provide hands-on science and math experiences, school to career students creating an on-line yellow pages of intern opportunities and service to the needy to expand on civics lessons. The variety of links between service and learning are only limited by the teachers and students imaginations. ​Students learn and practice a character-based decision-making process that supports conflict resolution, anti-bullying and alcohol and drug resistance programs. The Golden Compass provides students in grades 4 to 12 a four-step model to use character goals as a strategy to make positive choices. A student workbook is available to practice solving dilemmas relevant to middle school and high school students. Assembly programs are available to introduce the skill to students and professional development workshops support training of teachers. ​​SEE's ethics blog offers teachers a weekly current event story where students can be provided a case narrative, media link to the case and guided questions to encourage ethical analysis and judgment.